Keen to explore Cairo during a layover at Cairo International Airport? This private sightseeing tour is just the ticket. 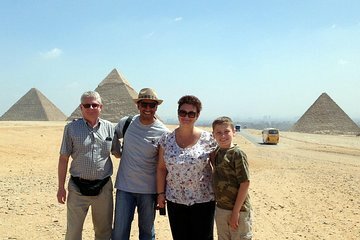 With an Egyptologist guide beside you, visit the Giza pyramids and Sphinx, admire Tutankhamun’s treasures at the Egyptian Museum, see the Mohammed Ali Pasha mosque at the Saladin Citadel, and visit the famous Hanging Church in atmospheric Coptic Cairo. Cap everything off with a 1-hour Nile cruise aboard a ‘felucca’, one of the traditional, white-sailed boats that still ply the fabled river.